For years, social impact has been a growing area of emphasis at business schools. Increasingly, MBA students are stating that a well-paying career isn’t enough: They also want to make a difference. MBA programs incorporate social impact into their programs in various ways, through global experiences, coursework, clubs, competitions, and more. MBA students may also have opportunities to team up with corporations, government agencies, and nonprofit organizations to get hands-on experience during their graduate studies. So if you’re interested in social impact, what opportunities should you look for within an MBA program? Some schools run entire centers and initiatives dedicated to the idea of social change. Typically, these centers provide the foundation around which a variety of social impact opportunities are built, including research, career help, events, and course development. For example, the McCombs School of Business at UT Austin recently launched its Social Innovation Initiative, which provides students, faculty, and the community with preparation to promote social change. 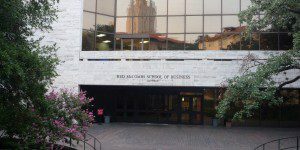 The initiative offers graduate-level curricular offerings, with courses such as “Energy Technology and Policy” and “Invisible Global Marketing.” There are also many extracurricular activities such as the Social Impact Investment Fund, a peer-created fund that provides financial support for MBA students pursuing internships in the social impact space. At Stanford Graduate School of Business (GSB), the Center for Social Innovation aims to bring about social and environmental change through research, education, and experiential learning opportunities. For MBA students, the center offers social innovation courses, study trips, the potential to participate in an investment committee, and fellowships to provide leadership opportunities. The school even hosts an annual ceremony each spring drawing together a tight-knit core of students, faculty, and alumni who share a commitment to social innovation. Three classes of awards are handed out to a dozen students at the event, and Dean Emeritus Arjay Miller, 101, attends to encourage the continuation of a community of social innovation he helped found at the GSB while dean from 1969 to 1976. Then, there’s the Yale School of Management Program on Social Enterprise. This initiative supports faculty, students, alumni, and practitioners in their pursuit of using business skills to achieve social objectives. It does this by offering a span of programs including courses such as “Global Social Enterprise” and “Managing Sustainable Operations,” as well as research, conferences, and publications. For extracurricular activities, students can participate in the Social Impact Lab, a weekly forum with opportunities to engage with industry leaders and each other, as well as the Economic Development Symposium, an annual conference that brings together eminent scholars, action agents, and key opinion leaders to work on solutions to pressing economic development issues. For many business schools, social entrepreneurship is offered part and parcel with their MBA degrees. These programs can range from a one-week social enterprise trip overseas to a formal concentration within the MBA program. At Northwestern University’s Kellogg School of Management, MBA students can elect a Social Impact pathway concentration. This pathway is designed for students who want to create positive social change and includes required courses on a variety of topics from “Leadership and Crisis Management” to “Public Economics for Business Leaders” and “Health and Human Rights.” Within the pathway, there are three tracks: policy, nonprofit, and social innovation, each offering in-depth coursework to position students for their desired careers. Meanwhile, MBA students at Emory’s Goizueta Business School can explore social impact through an annual seven- to 10-day Social Enterprise @ Goizueta Trip. These trips take students to countries around the world to observe the challenges that local economies face and develop market-based solutions. Alumni and evening MBA students can also travel to Nicaragua to visit coffee farms and meet growers. Full-time MBA students can visit Nicaragua or El Salvador to explore social enterprises on the ground and work on community health projects. Some schools offer hands-on experience in social impact to their students in the form of social venture competitions. Through Harvard Business School (HBS)’s Social Enterprise Initiative, which aims to educate, inspire, and support leaders across all sectors to create social change, MBA students can participate in the New Venture Competition (NVC). The competition offers participants a grand prize of $50,000 as well as workshop opportunities, feedback, and business plan development advice. Designed for students and alumni interested in using their business skills to create innovative approaches to tackling social problems, the Social Venture Competition at NYU Stern School of Business is similar to that of HBS’s NVC. Over the last 11 years it has awarded more than $900,000 to startup social ventures developed by students. Net Impact is one of the most popular social impact clubs, with chapters across the globe. More than 100,000 individuals have joined more than 300 chapters across the world to take on social challenges, protect the environment, and orient business toward social impact. The Net Impact chapter at UCLA Anderson School of Management, for example, has been awarded Gold Status, which recognizes it as a high-performing chapter and qualifies it to serve on the national Net Impact advisory board. One of highlights of Net Impact is the annual Net Impact Conference, which welcomes attendees from across the globe to hear from keynote speakers, such as Clif Bar CEO Kevin Clearly and Derreck Kayongo, the CEO of the Center for Civil and Human Rights. Attendees at the Net Impact Conference can also take part in a variety of workshops, panels, and boot camps on topics ranging from civic engagement to equity. In addition to Net Impact chapters, many MBA programs also offer their own social enterprise-focused student organizations. For example, the Social Enterprise Club at Columbia Business School connects students with faculty, alumni, professionals, and organizations to develop business skills and create social, environmental, and economic value. At Oxford Saïd Business School, MBA students have the opportunity to apply for the Skoll Scholarship, a competitive award for students pursuing entrepreneurial solutions to urgent social and environmental challenges. The scholarship provides funding as well as opportunities for the award winners to meet and interact with world-renowned entrepreneurs, thought leaders, and investors. To qualify, an applicant must have three years of experience in social enterprise and be an incoming MBA student. At Duke’s Fuqua Business School, there’s the CASE Social Sector Scholarship for incoming daytime MBA students. Scholarship recipients receive at least 25 percent tuition support as well as funding from the CASE Summer Internship Fund. Incoming MBA students who can demonstrate their commitment to applying their business skills in the pursuit of social impact are eligible to apply. This is far from an exhaustive list—rather it’s a sampling of the wide-ranging opportunities to study social impact across MBA programs around the world. We hope it can provide a jumping off point as you begin to investigate social impact opportunities at your target schools. This article has been edited and republished with permissions from Clear Admit.